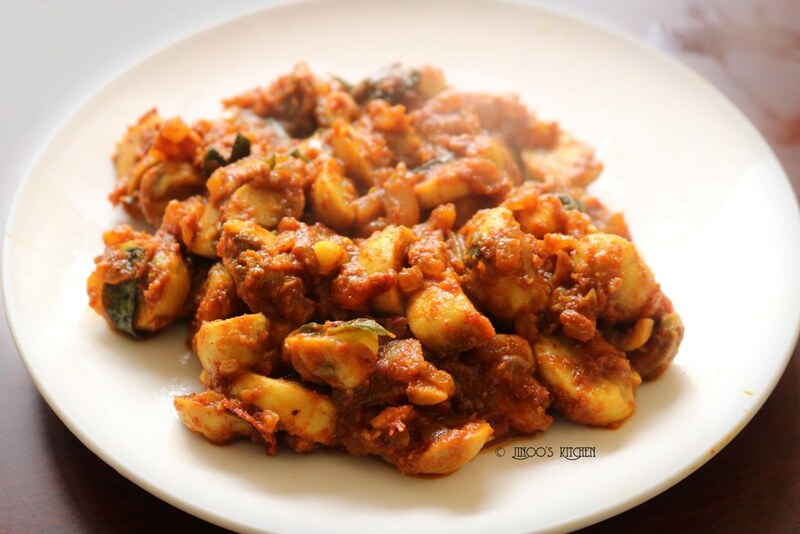 Garlic Mushroom recipe | Chilli Garlic Mushroom fry recipe | Mushroom starters recipe – is a spicy, garlic flavored dish that goes well with roti, stuffing for dosa or with plain rice, pulav or can be just had plain as a starter. 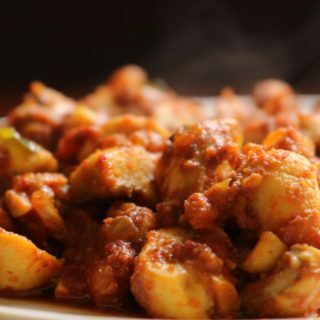 We make a similar version of this regularly which we use to call it as “ulli milagu koon / onion chilli mushroom” just that we prepare the chilli onion chutney and cook the mushrooms with that chutney. 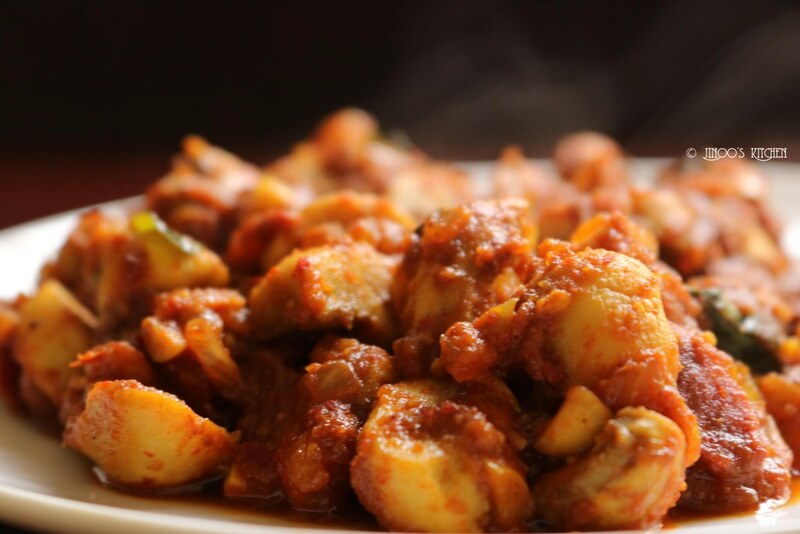 It tastes so good, simple and we love it with rice and roti. this is improvised version with garlic, garam masala flavored. 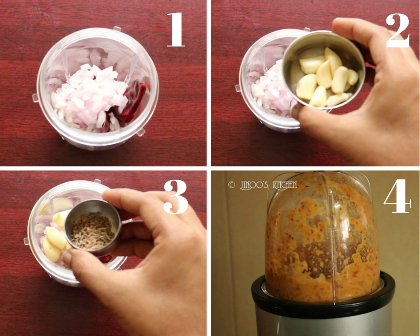 firstly, blend together red chillies, onions, garlic, cumin to a fine paste. heat oil in a pan and fry garlic cloves and curry leaves. add chopped onions and fry till slightly brown. now mix in the garlic red chilli paste and fry until the raw smell goes off. add sliced mushrooms, turmeric powder, red chilli powder, salt and garam masala. mix well. sprinkle little water, close and cook the mushrooms. we need not add any water when cooking mushrooms as it will release more water. As you can see I have not added any water but in the next pic you could see how much water is released from the mushrooms. But if you are cooking on high flame, sprinkle very little water to avoid burning. open after 5-10 minutes or after the mushrooms are soft. now keep the flame medium and fry till you reach the consistency you require. either fry if you wanted a starter or leave it semi gravy as in the pic to have with rice or roti. heat oil in a pan and roast the garlic chopped and curry leaves. also add chopped onions and fry until slightly brown. at this stage, add the prepared paste and mix well and fry until raw smell goes off. further add sliced mushrooms, salt, turmeric powder, chilli powder, garam masala and mix well. open and fry again to make it dry or leave it for a semi gravy consistency. to make a dry version, cook for longer time until it gets roasted well.